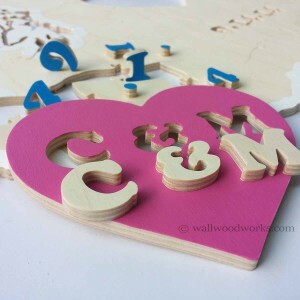 Options Choose an option2 Initials in Heart Format K + D2 Initials, Heart Format K + D, Date2 Initials, Heart, K + D, Date & 3 Shapes2 Initials in Heart K & D2 Initials Heart, K & D, Date2 Initials Heart K & D, Date, & 3 ShapesOther - Choose your layout! Stamping on the backside of each pieces so guests only sign the front. 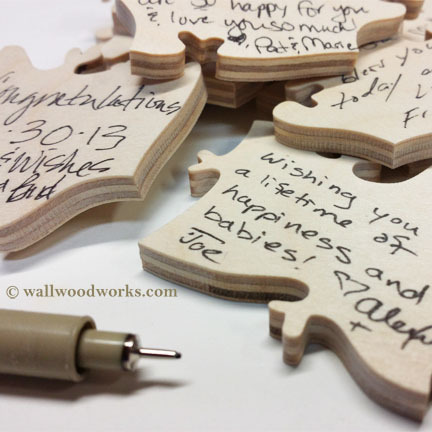 A natural state wedding puzzle guest book gives you a variety of design options. Of all of the states within the United States you can choose the one that means the most to you and your fiancé’. It could where you have met, the place where you go to get away, or the location of your wedding. 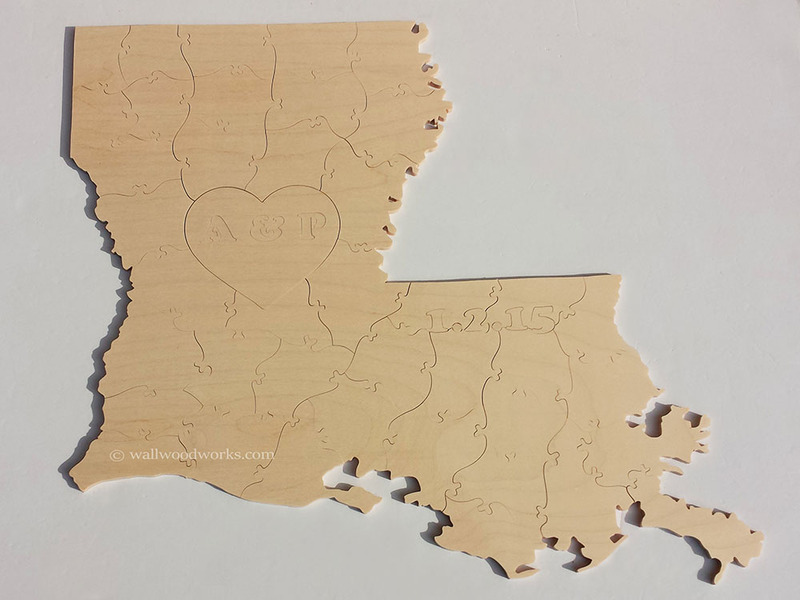 The state that is shown in the images is the state of Louisiana but you can choose the state you would like the outside of your puzzle to be cut as. The primary appeal of this particular puzzle type is your guests are able to sign the front of the puzzle as opposed to the back. Then when you finally decide to frame it you can see all of the signatures! 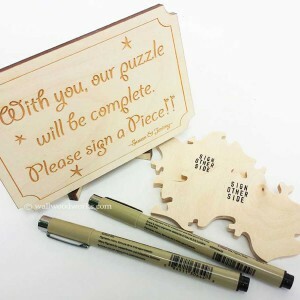 The recommended amount of sign-able pieces that you need for your natural state guest book puzzle is based upon the number of guests you have attending your event. Typically 70-80% of the total guest count is recommended. This is because most of the times couples sign together, children do not sign, and single people sign for themselves. On the complete flip side of the token we have had clients order one piece per. guest or more for entertainment as well the puzzle being a guest book. 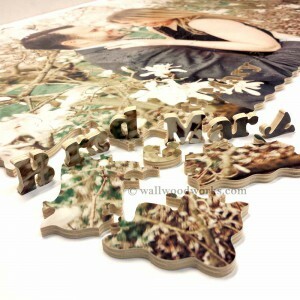 Choose any state within the United Stated for the overall shape of the natural state wedding puzzle. Initials in the heart. (In the format of K + D). Initials in heart as. (In the format of K + D) with the date outside of the heart. Initials in heart. (Format – K + D) with the date outside of the heart, & 3 shapes. Initials in heart. (In the format of K & D) with the date outside of the heart. Initials in heart. (Format of K & D) with the date outside of the heart, & 3 shapes. 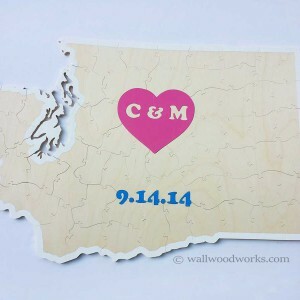 Other – Choose your own state wedding guest book puzzle layout! 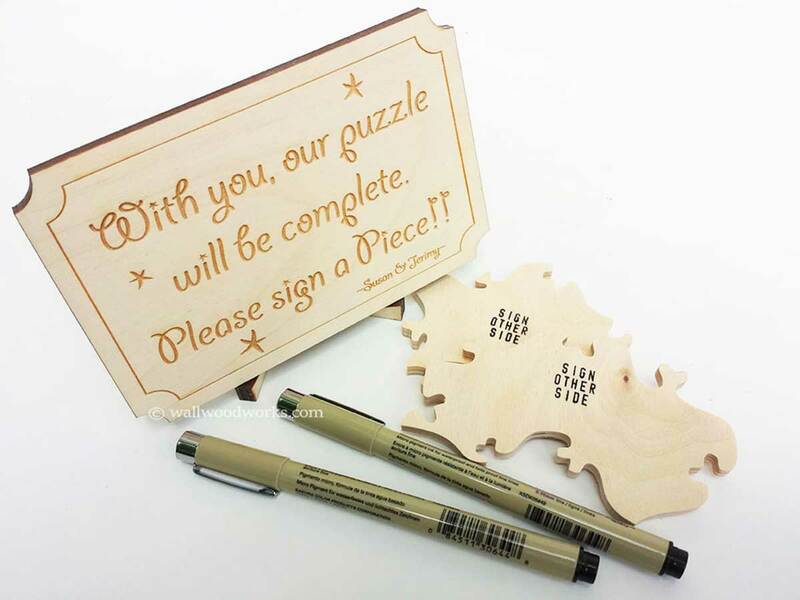 Select the number of pens you would like included with your natural state wedding puzzle. The first pen is free. We recommend one pen for every 25 or so guests. We currently only stock black pens. 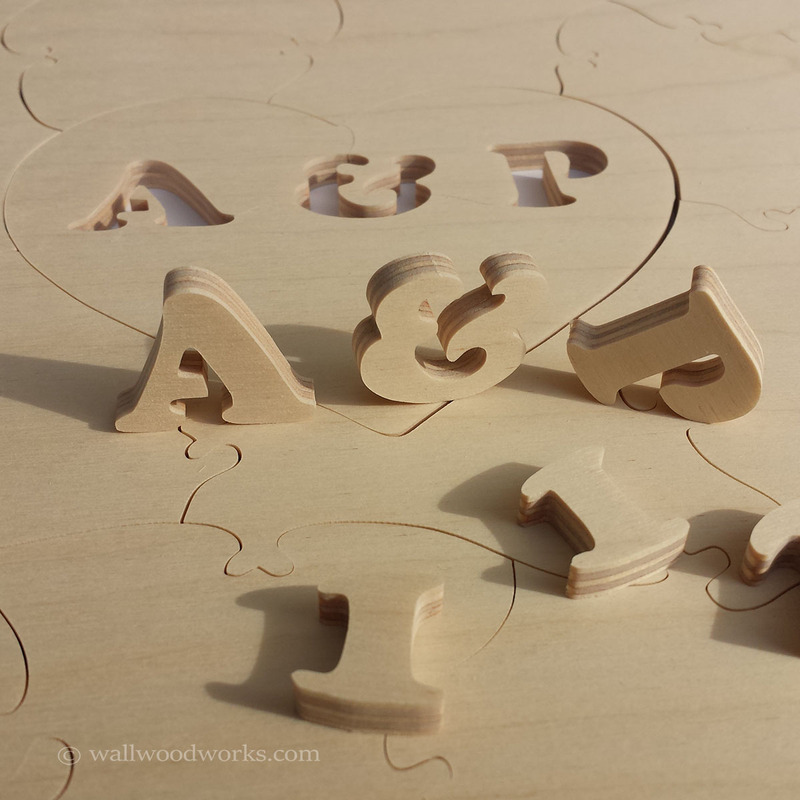 Select the type of sign you would like to be included with your natural state wedding puzzle. There are two type of signs that are available. 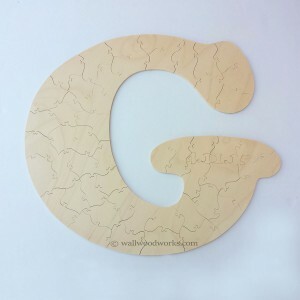 A basic square sign is included with the puzzle and has a message so your guests know to sign a piece. The premium sign is much larger and more decorative. You also have the option of having the premium sign engraved with your two names. By default “Sign Other Side” will be stamped on the back of every piece so guests know which side to sign and no signatures are lost when the natural state wedding puzzle is framed. This is matter of preference, some of our past clients prefer it some do not. If you do not want stamping enter NO STAMPING with in the details box. 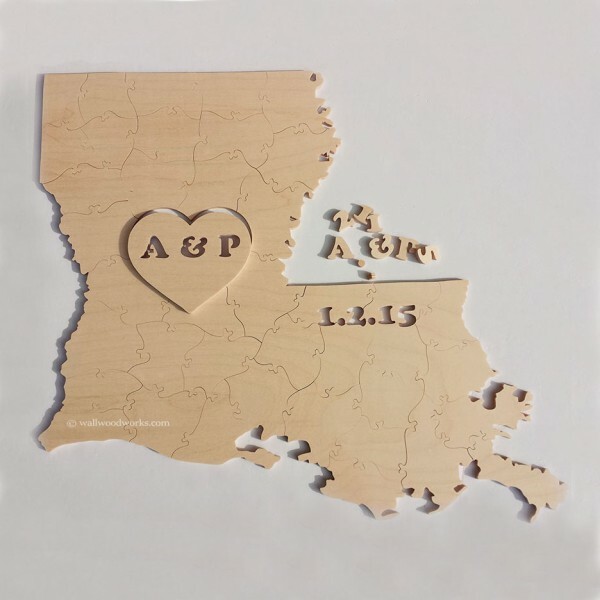 Natural state wedding puzzle pieces are typically quite larger than normal wood jigsaw puzzles pieces at roughly 1.50″- 2.5″ square. This is so guests can sign the front of the puzzle piece and leave a message. Puzzle size is based upon the above ratio, which greatly varies from puzzle to puzzle especially with land masses and state shapes. States that have a large amount of negative space typically are larger. For example a puzzle shaped like Florida would have larger over all dimension as opposed to a state puzzle shaped like Utah. They both have the same surface area, but Florida is thinner and more narrow compared to the compactness of Utah. Wow!! Better than we imagined! It was a little challenging - took longer than I care to admit to put together - and absolutely beautifully constructed. The craftsmanship and dedication to your work is evident In each unique piece. We couldn't be happier, and can't wait for our family and friends to see and sign it at our wedding. I ordered this puzzle as a rush order on a Friday, Jason was able to make it and have it shipped out by Monday morning the following week. Highly recommended and I will be ordering another in a few weeks. It came out perfect, just like the description and picture showed. I love it Thank you! 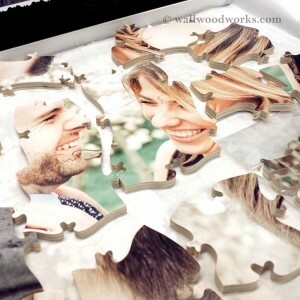 The puzzle looks great, all the pieces fit together. My only issue is that it's a little harder to put them together as the front and back look the same, the edges look a lot the same also. That's the only issue but other then that it's looks amazing and I can't wait to use it at my wedding. This is Totally awesome Jason!! We both love this! Juan says it exceeded his expectation! The hearts, the design, it's just super amazing! Jason is a consummate professional in both his workmanship and customer service. My puzzle is well crafted and arrived in record time. He took the time to answer all my questions both before and after my purchase. Based on my research of Jason I find him to be trustworthy, kind and a businessman with integrity and loyalty to his customer. I couldn't recommend him more highly.